Inclusive, progressive and equitable: Policies will significantly increase benefits for lower-income households and households of color. Impactful: Policies will have a significant and sustainable impact on the relative economic mobility of lower-income households and households of color. Accessible: Where relevant and feasible, policies will include automatic enrollment features and low costs to maximize access by low-income households. Simple: Policies will be easy for everyone to understand. Transparent: Policies will include provisions that enable Americans to measure and track outcomes over time. 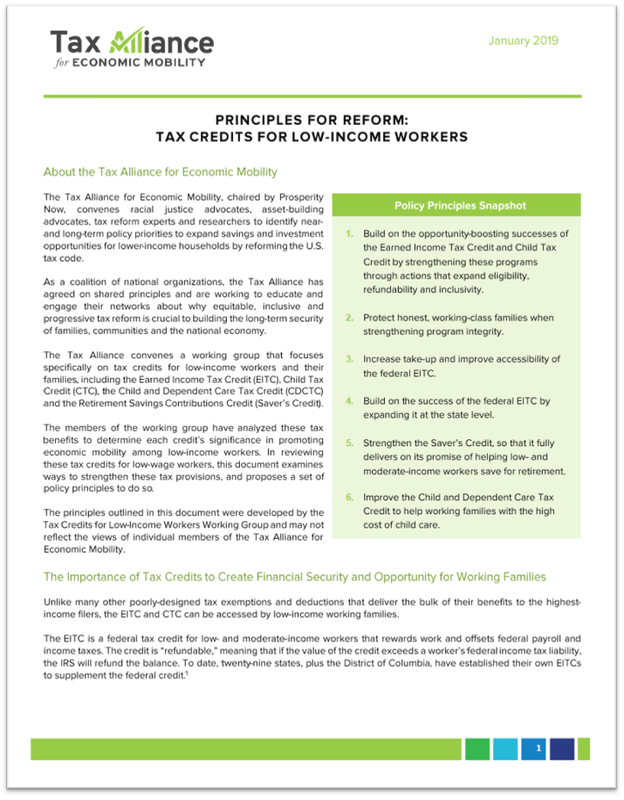 As we have highlighted throughout this brief, the Earned Income Tax Credit (EITC), the Child Tax Credit (CTC), the Child and Dependent Care Tax Credit (CDCTC) and the Saver’s Credit provide crucial support to millions of families each year. They are well-targeted to reduce poverty and are proven to support and encourage work, support children’s development throughout life and boost retirement savings. Unlike many other tax incentives that primarily benefit higher-income taxpayers, these credits are progressive. As a result, these credits do not need broad restructuring. Rather, reforms are necessary to ensure that these credits are able to achieve their full potential towards helping low- and moderate-income working families. To accomplish these goals, policymakers should build on each credit’s strengths and successes, while also closing gaps in access to the credits and improving their effectiveness. The federal government is justified in investing in homeownership programs, which can have positive impacts on individuals, communities and the economy. One of the largest tools the federal government uses to invest in homeownership is the Mortgage Interest Deduction (MID), which in 2017 cost more than $65 billion in taxpayer dollars. Unfortunately, the MID does not focus on low- and moderate-income families. In fact, only one out of four taxpayers receive any benefit from the MID, and these households tend to have higher income. Even among households that do benefit, higher-income households receive greater value for each dollar deducted and tend to claim the deduction for much larger mortgages. 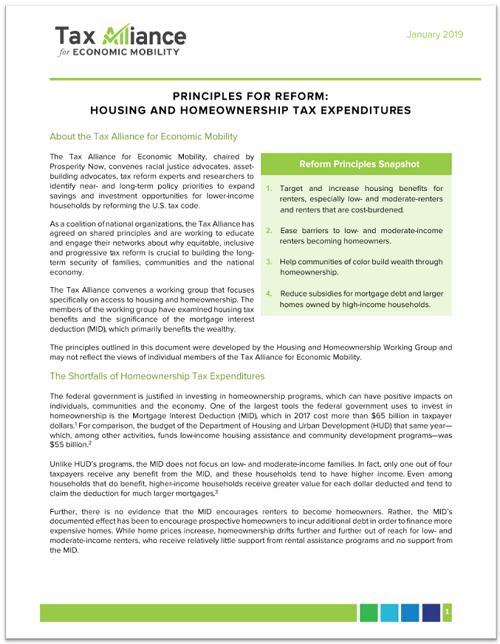 The Tax Alliance has adopted a set of principles for reforming the MID that would seek to expand access for lower-income Americans, increase benefits for renters, help communities of color build wealth, and reduce subsidies for high-income households.